Once whitelisted your Server IP's, log into our client area and download the Resellerclub Mods Management Core Console Addon v4, available from any of the product license details page TAB "Downloads". Unzip the file with your prefered decompresion software. Upload the folder "modules" from the unzipped local folder \rcmcoreconsole_X.Y.Z_PHP_5.X\ into the folder where you have installed WHMCS. 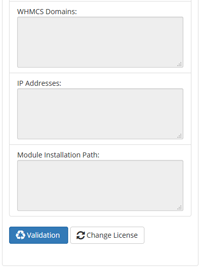 You can now start with installing and configuring the Module. Please visite the corresponding Installation Documentation for the purchased Module license. To change the current WHMCS Admin User, select from the dropdown menu the WHMCS Admin User who will be used for local API calls and click the Button "Change Admin User"
With the initial setup of the Core Addon you have configured your Reseller Account. You can now add more Reseller Accounts. 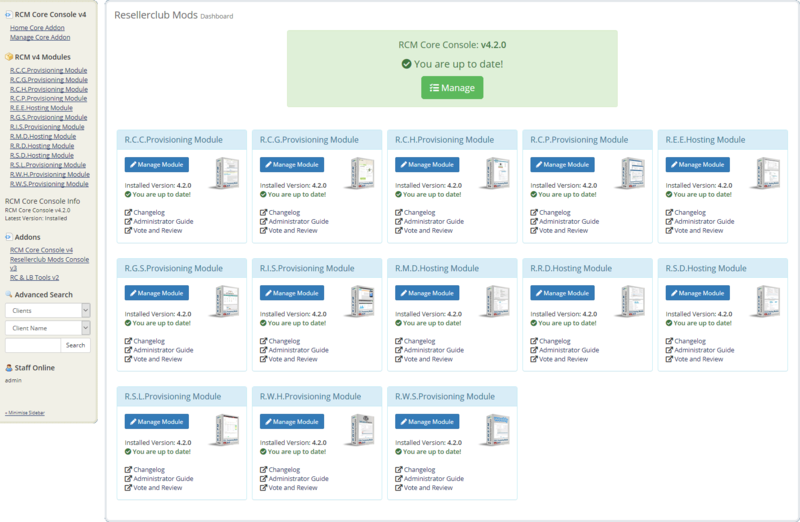 This will allow you to setup Products using our Modules with different LogicBoxes Providers such as ResellerClub, NetEarthOne and many others at the same time. 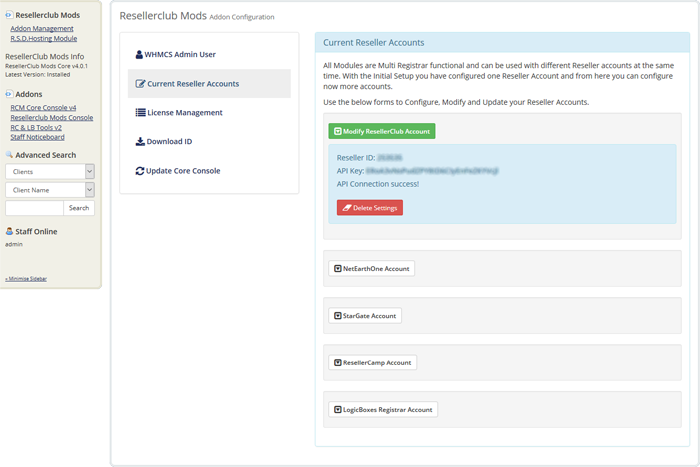 To setup a new Reseller Account, click the corresponding "Registrar Account" Button and insert your Reseller ID and API Key. Note: A Registrar in WHMCS is an unique entry. This means you cannot setup two ResellerClub Registrars. However, you can setup another Registrar such as "NetEarthOne" with Reseller ID and API Key from another ResellerClub Reseller Account. To modify an Account, click the Button "Modify [Registrar Name] Account". This will show the form fields. You can change the Reseller ID and the API Key whenever you need to update these details. To add a new Account, click the "Registrar name Account" Button for which you have configured your "WHMCS Registrar Module" in WHMCS » Setup » Products/Services » Domain Registrars. 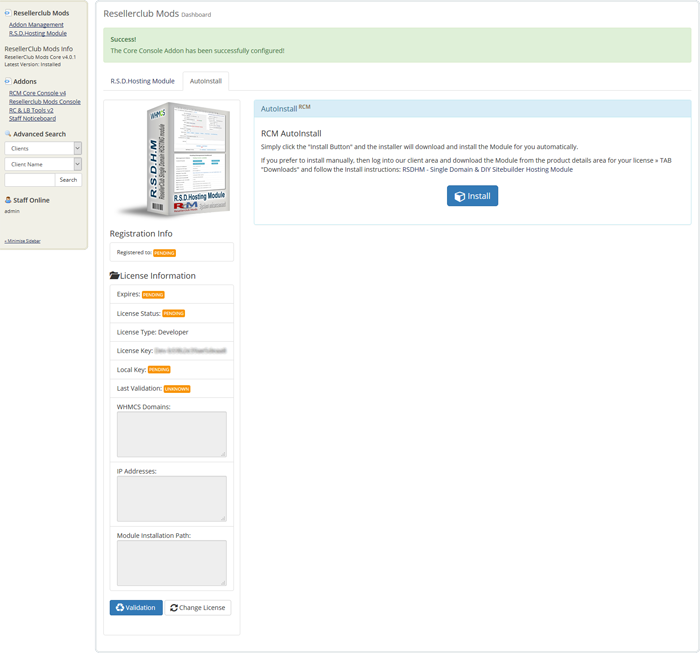 For example, if you use the Registrar Module "NetEarthOne" then click the Button "NetEarthOne Account". If you use another "LogicBoxes Registrar Module" not available by default in WHMCS, then use the Button "LogicBoxes Registrar Account" and select from the dropdown menu your Registrar Module. Insert Reseller ID and API Key and save the settings. With the initial setup of the Core Addon you have configured your first Module License. From here you can add all your other current and future acquired licenses as well as modify or delete a license key. Select the Module from the dropdown menu for which you have a valid license key. Insert your license key exactly like you received it. You can also fetch your license key for each module by logging into our client area and navigating to the products list or products details license page. Click the Button "Add new License". Change the current License Key with the new License Key and click the Button "Modify License Key". If a license key has expired and you do not want to renew and use the module anymore, then click the Button "Delete License Key". Finally delete the module from your whmcs installation. Further details about how to delete/uninstall a module is available in the Installation Documentation for each module. With the initial setup of the Core Addon you have already configured your Download ID. However, under certain circumstances it would be necessary to change the Download ID, eg. your licenses have been transferred to a new Account. Here you can change the Download ID whenever necessary. Log into our Client area and navigate to the Products License list from where you can see your unique Download ID. Copy/paste and replace your current Download ID with the new one and save the changes with the Button "Change Auto Install/Update Download ID". Whenever we release a new update you will be notified instantly by accesing the Core Addon Home. All you need to do is click the Update Button and the Addon will be updated automatically to the latest available stable release. 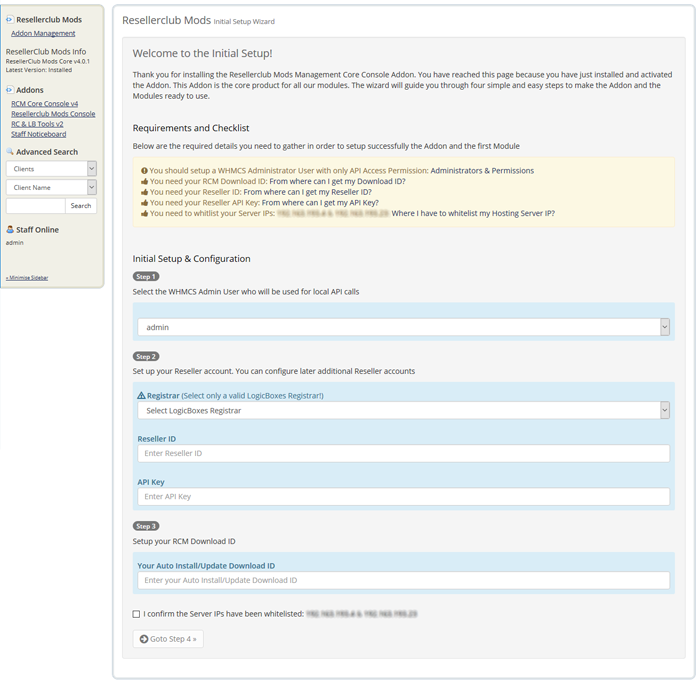 Download the ResellerClub Mods Management Core Console, available from any of the product license details page in the Client Area. Unzip the file with your prefered decompresion software. Upload the complete folder "modules" from the unzipped local folder \rcmcoreconsole_X.Y.Z_PHP_5.X\ into the whmcsroot/ folder. The "whmcsroot" folder is where you have installed your WHMCS. 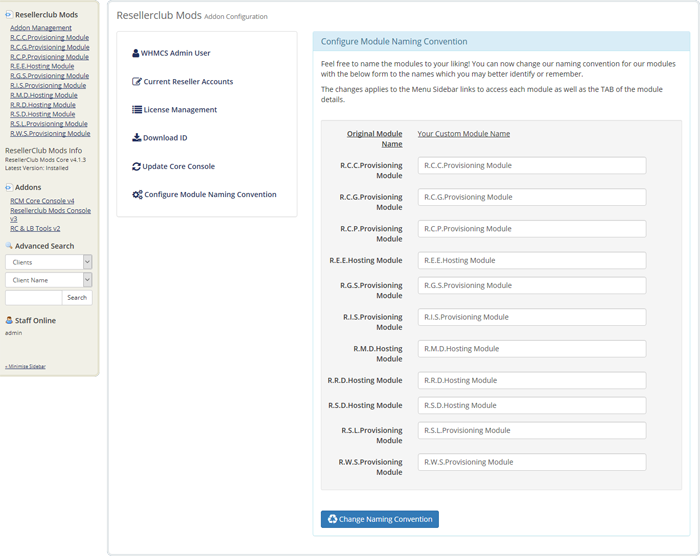 Access the Resellerclub Mods Console Addon to get the new version number stored. Feel free to name the modules to your liking! You can now change our naming convention for our modules with this interface the names which you may better identify or remember. The changes applies to the Menu Sidebar links to access each module as well as the TAB of the module details.